Your master bedroom should reflect your personality and the style of bed you choose makes the first impression. Poster beds feature added height with four posts at the headboard and footboard. Some poster beds also include alternate height posts to create a unique look. Around the Washington DC metropolitan area, we are certainly accustomed to large homes with grand master bedrooms. Architectural details often include tray ceilings and sitting area extensions to add depth and grandeur to the room where dreams are made. To fill these luxurious rooms, the style of bed you choose speaks to your personality and a poster bed seems to be the perfect fit for the tall ceilings and grand details. While many poster beds feature a traditional style with antique inspired details, there are more transitional and contemporary styles available too. With a unique two-tone look, the Cordevalle Poster Bed is the perfect transitional style poster bed. Whether you choose this bed for your master bedroom or outfit your guest bedroom for a statement making 'wow', this poster bed is sure to impress. The curved headboard and charming bun feet are a winning combination. Plus - this bed comes with multiple posts in three various heights to create your own combination or change the look as you wish! Did you know that the Cordevalle Poster Bed made the cover of our Fall 2014 – Winter 2015 Catalog! Classic style and a modern edge combine to create this Young Classics Poster Bed with a unique cut-out headboard. 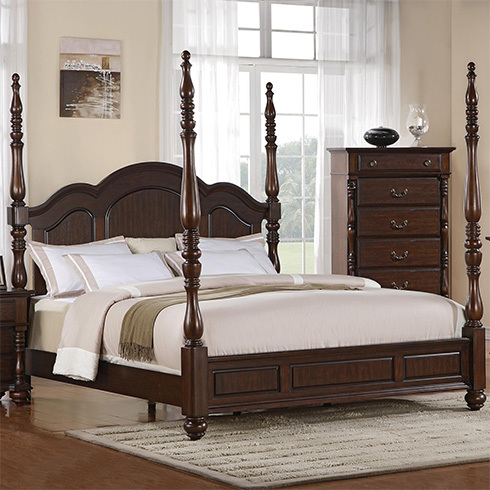 Shown above with the short caps on the front post, alternate posts are also included with this bed to create the perfect combination of post sizes. Look up close at the posts and you'll notice intricate floral carving details. 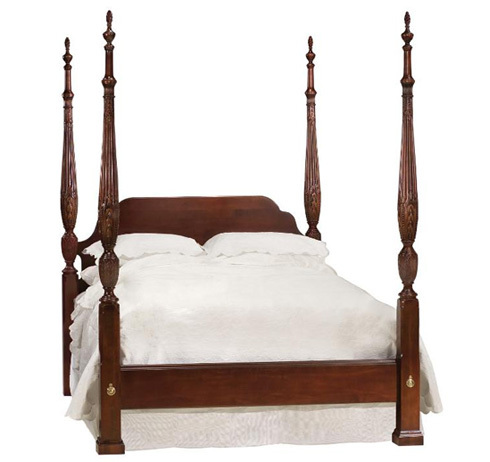 A favorite for over 300 years, the rice carved carriage bed is an antique style that's perfect for traditional homes. This poster bed features intricate carving details and high, souring turn posts. The sophisticated style provides a warm feeling instantly as you enter the bedroom. Another classic design, the Georgia Poster bed features some softer curves and an elegant look. A rich deep brown finish anchors this setting in your bedroom and easily coordinates with your favorite bedding designs. A timeless design, this poster bed will never be out of style. For a different look, transform your bedroom into a chic french inspired oasis. 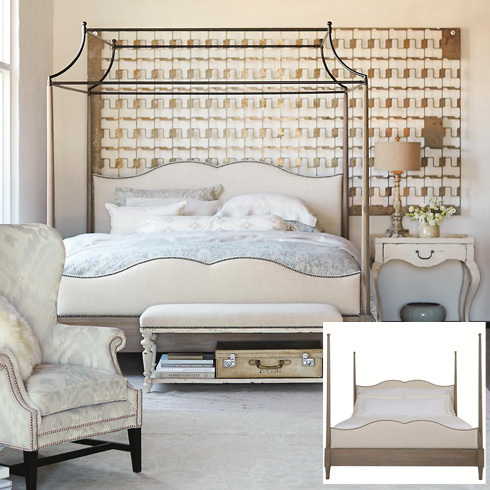 The Auberge Poster Bed features a trending weathered oak finish and upholstered headboard and footboard. Easily convert this bed to a canopy with the metal topper or keep it as a classic poster bed. For more poster beds and bedroom design ideas and inspiration, visit Belfort Furniture. Conveniently located in Dulles, Virginia, Belfort Park is home to over 100,000 square feet of showroom space, spread throughout four buildings. Need some Design Help? Use our simple online form to tell us about your room or project and we'll respond with some great design ideas customized for you!